Woking Football Club | News | Cheer on the Cards in February thanks to these Fabulous offers! Cheer on the Cards in February thanks to these Fabulous offers! February is a month of fabulous offers at The Laithwaite Community Stadium, with the Cards playing four Vanarama National League South matches at home. Dowse's team play Dartford on Tuesday 5th February, and this match has a reduced admission offer for Adults, only £10 instead of the standard £15! There are still Matchday Hospitality places available for this match too, please contact the Commercial Team on commercial@wokingfc.co.uk or 07395 831297 to book your place in the Geoff Chapple Lounge. 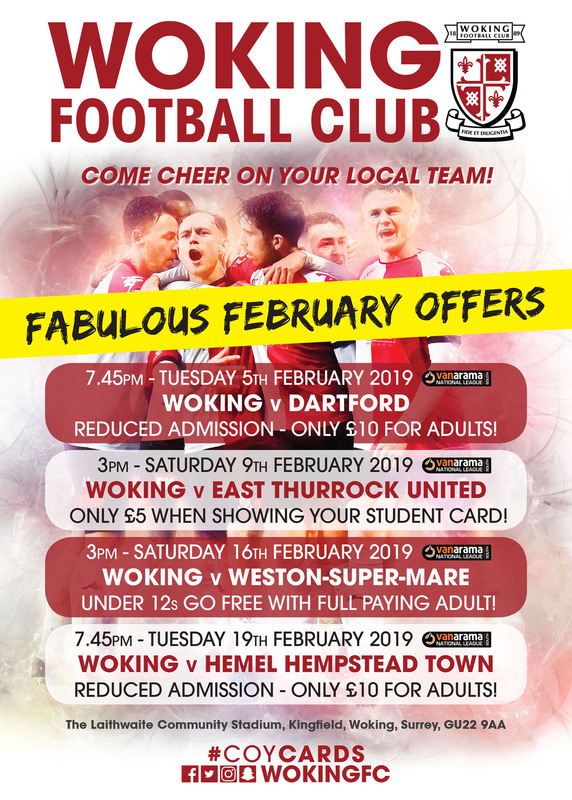 On Saturday 9th February we have a fantastic offer for Students, with tickets costing only £5 when showing your student card at Woking Football Club's match against East Thurrock United. To kick off half-term week, why not bring the kids down to our match against Weston-super-Mare on Saturday 16th February? It's FREE for Under 12s when they're accompanied by a full paying adult! Our final offer is for the match against Hemel Hempstead Town on Tuesday 19th February, when again it will be reduced admission for Adults, only £10 to see the Cards. Come cheer on your local team as we push for promotion back to the Vanarama National League!